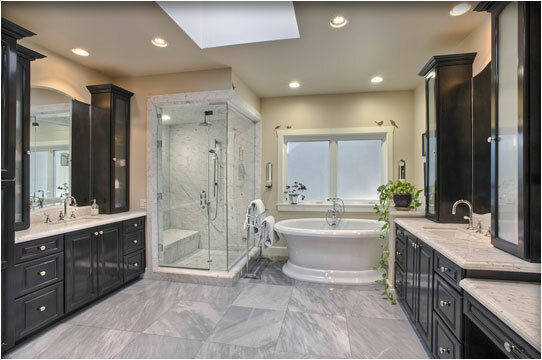 Latest Design Option 3-2, Master Bathroom Addition » Roger Perron Inc. Here we have a master bathroom addition that provides a seamless connection to the master bedroom addition. The bathtub is deep and provides for a wonderful full-body steeping bath. The shower serves also as a steam room fit for two. Plenty of cabinets keep everything in its place and convenient for this master bathroom, which was an owner’s dream that was turned into reality. Interior design for this master suite addition in Granada Hills was created by Michelle Ames; design-build services provided by Roger Perron, general contractor.